Campfire is located 130km north of Mississauga in Markdale, Ontario on a 165-acre property on the Saugeen River. Campers take part in sports, games, singing, Bible study, skits, swimming and, of course, campfires. Campfire exists to provide an exciting environment for kids to have fun and make friends, all while strengthening their knowledge of the Bible and their commitment to Christ. I arrived halfway through Teen Week, which is for kids aged 13–16. Earlier in the week, the kids got to choose an artistic activity that they wanted to explore more in depth. When I got there, I met the thirteen kids that chose to develop their photography skills and we spent a short time introducing ourselves. 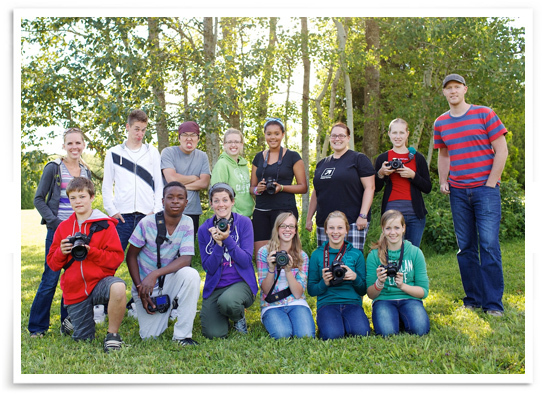 I had a great group of kids who were all interested in photography for one reason or another. Some liked taking pictures of animals, some preferred landscapes, and a few brave ones were interested in shooting portraits and candids. One of my goals for the kids was to get their cameras off of the green or auto-mode and into a mode where they have creative control. Shutter speed, aperture, ISO – all three work together to create an exposure, so getting that across to the kids was key in having them understand how their cameras work. After a brief explanation of the basics, the kids were released into the wild and they wandered around snapping pictures. I would regularly check in with each, asking what they were trying to capture, making sure they understood their cameras and then offering tips on ways to get a better shot. It was great to see the kids discovering things to shoot and ways to improve their photos. At the end of my two days at Campfire, the staff hosted an art and performance night where everything that the kids had produced, created and rehearsed throughout the week was presented. The best photos from each of the kids were printed and displayed and the rest of the camp had a chance to view them. It was a very cool event and a ton of fun. Hopefully, I helped my group gain a deeper enjoyment of photography by giving them a better understanding and then just allowing them to have some fun exploring Creation with it. A few of the photos that the kids took are below.